We stock industrial quality reeds with epoxied dents in 4, 5, 6, 8, 10, 12, 15 & 20 dent. Note reeds come in four standard lengths 26", 37", 46", and 61". All are 5 inches high. If you need an inch between length we can either special order or cut to fit. The cut to fit do not have an end bar on the cut end but are structurally sound . We can special order shorter and taller reeds as well. Stainless have a red case Carbon have a black case. Actual maximum width is 25.5". Use decimal notation for widths. For example 26.5 for 26 and 1/2 inches. If you do not want your reed cut, please still enter the full length in inches. Our reeds are industrial quality with epoxied dents. Weavers who work or store reeds in damp should consider stainless steels reeds. There is no more thankless job than trying to remove rust from between the dents of a reed. Note reeds come in four standard lengths 26", 37", 46", and 61". All are 5 inches high. If you need an in between length we can either special order or cut to fit. The cut to fit do not have an end bar on the cut end but are structurally sound. We can special order shorter and taller reeds as well. Stainless have a red case Carbon have a black case. 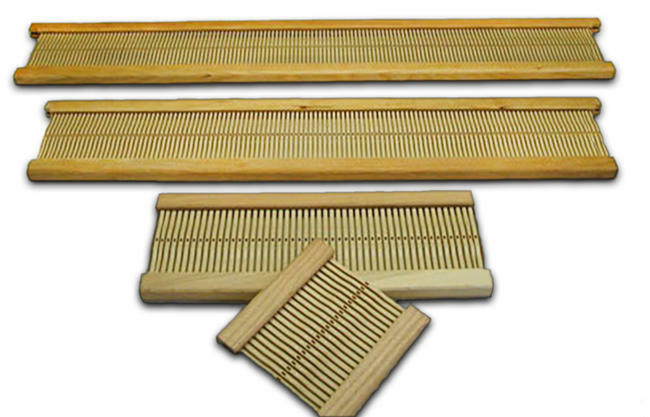 Actual maximum weaving width is 25.5"
Our reeds are industrial quality with epoxied dents. 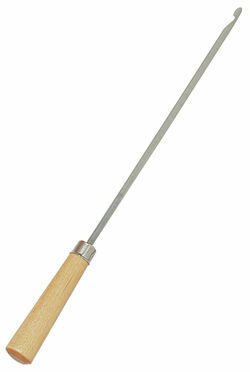 Weavers who work or store reeds in damp should consider stainless steels reeds. There is no more thankless job than trying to remove rust from between the dents of a reed. Note reeds come in four standard lengths 26", 37", 46", and 61". All are 5 inches high. If you need an in between length we can either special order or cut to fit. The cut to fit do not have an end bar on the cut end but are structurally sound. We can special order shorter and taller reeds as well. Stainless have a red case Carbon have a black case. Expected shipping 4-6 weeks. This item may ship separately from other items in order. More Info. Expected shipping . This item may ship separately from other items in order. More Info. Our reeds are industrial quality with epoxied dents. Weavers who work or store reeds in damp should consider stainless steels reeds. There is no more thankless job than trying to remove rust from between the dents of a reed. Note reeds come in four standard lengths 26 in, 37 in, 46", and 61 in. All are 5 in high. If you need an in between length we can either special order or cut to fit. The cut to fit do not have an end bar on the cut end but are structurally sound. We can special order shorter and taller reeds as well. Stainless have a red case Carbon have black. Actual weaving width is 45.5". Our reeds are industrial quality with epoxied dents. 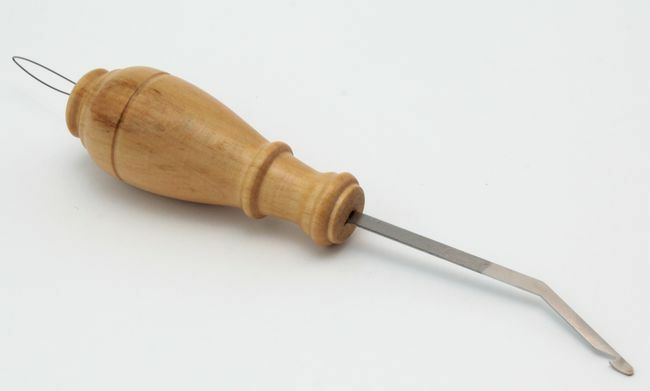 Weavers who work or store reeds in damp should consider stainless steels reeds. There is no more thankless job than trying to remove rust from between the dents of a reed. Note reeds come in four standard lengths 26 in, 37 in, 46", and 61 in. All are 5 in high. If you need an in between length we can either special order or cut to fit. The cut to fit do not have an end bar on the cut end but are structurally sound. We can special order shorter and taller reeds as well. Stainless have a red case Carbon have black. 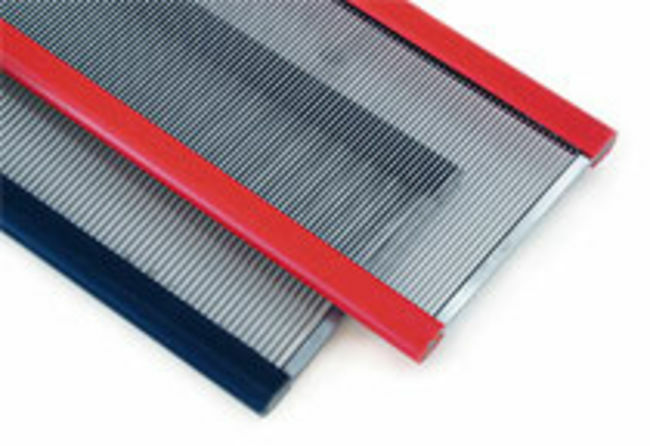 Actual weaving width is 60.5"
We stock industrial quality reeds with epoxied dents in 4, 5, 6, 8, 10, 12, 15 & 20 dent. Note reeds come in four standard lengths 26 in, 37 in, 46", and 61 in. All are 5 in high. If you need an in between length we can either special order or cut-to-fit. The cut to fit do not have an end bar on the cut end but are structurally sound. We can special order shorter and taller reeds as well. Stainless have a red case Carbon have black. Actual weaving with is 60.5". Add an extra rigid heddle to your Ashford Knitters Loom or build your own. Add versatility to your 24 in Beka Loom. The finer sett allows you to use finer yarns. Expected shipping 2-4 weeks. This item may ship separately from other items in order. More Info. Fits the Harp from Kromski or use to make you own loom. 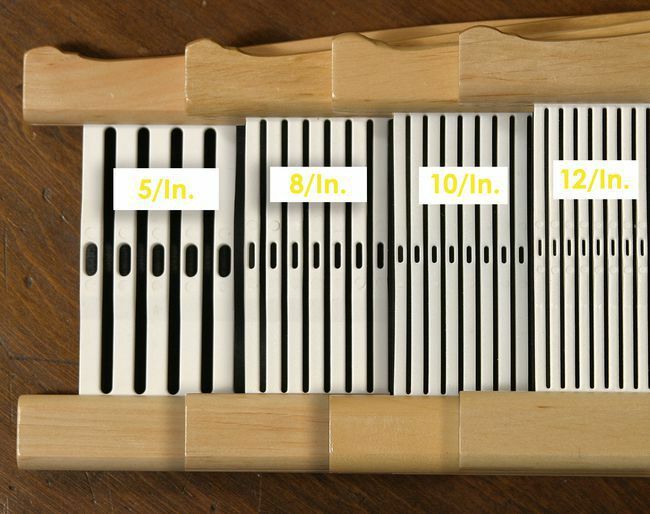 Replace the standard 10 dent heddle to add versatility to your 32 inch Harp Loom. 32" reeds do not have the curved top bar. 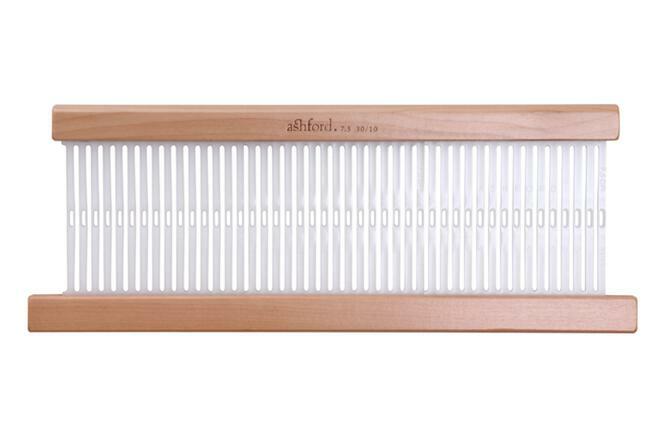 Here&apos;s a clever way to keep your reeds, clean, protected and organized. 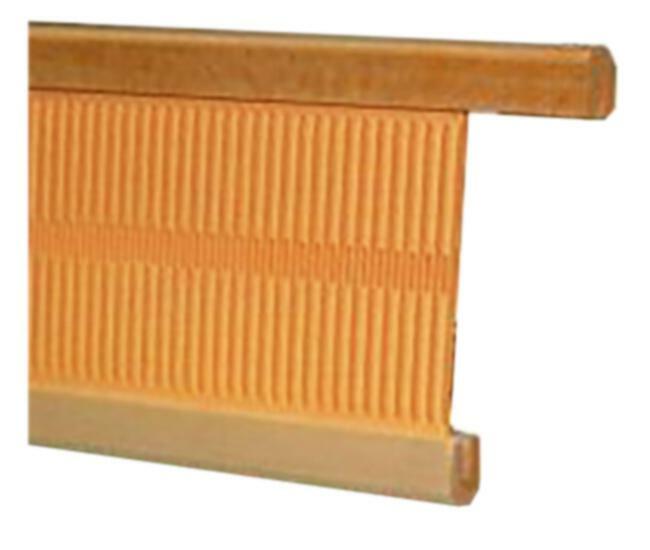 Made of rock maple and Baltic birch plywood, this rack can hold up to 6 reeds in varying lengths from 20" to 72". It can be attached to a wall, the back of a door or stand on its own. Measures 30" x 7.75" square. Comes finished and assembled. Made in USA. 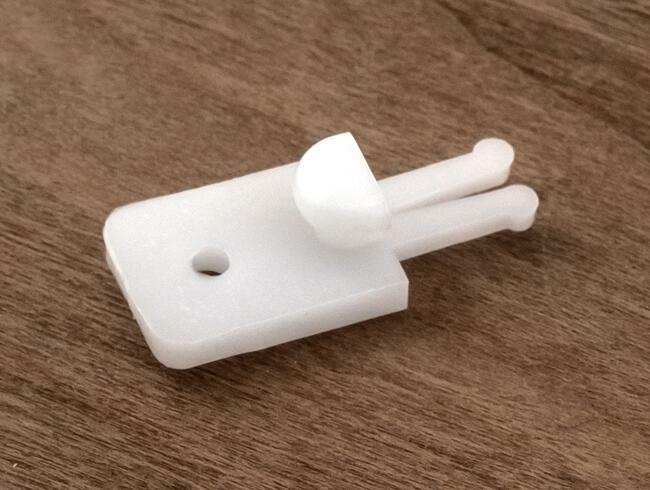 Organize your reeds with this handy stand. Store your reeds as well as your lease sticks and metal rods. Dimensions are width 27.25, depth 14.5, and height 23.75 inches. This item may have been disc or is temporarily unavailable. Give us a call! Texsolv 12 1/2" Long Eye Heddles (318mm). Item Number: 6212500L. Price:$23.00/ea. Texsolv 11 7/8" Long Eye Heddles (300mm). Item Number: 6211500L. Price:$25.00/ea. Wire heddles are lighter in weight than the flat steel and can accommodate thicker, bumpier yarns through their larger eyes. Not only that, but they&apos;re economical! Available in 9 1/2" , 10 1/2" and 12 1/2" lengths. Sold in bundles of 100. 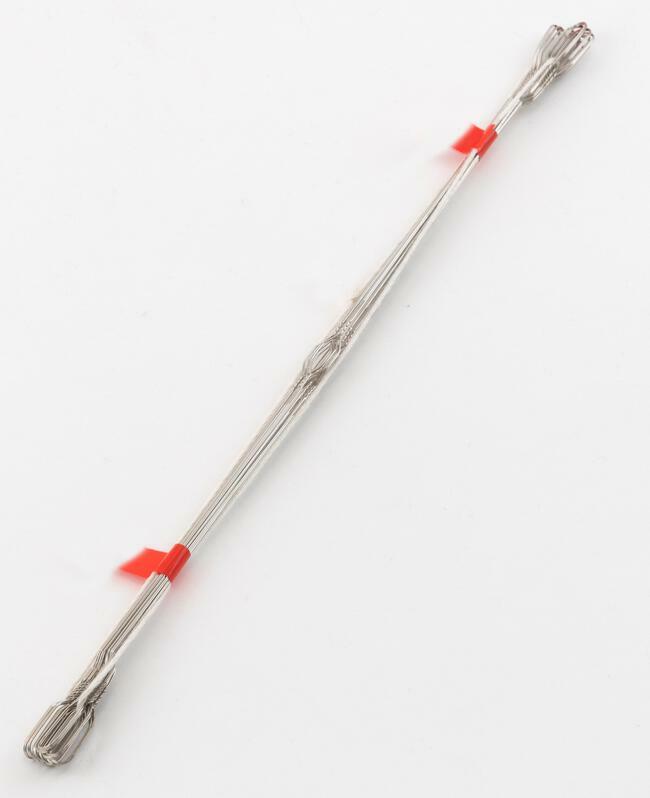 Leclerc&apos;s Wire repair heddles are available in 9 1/2", 10 1/2", and 12 1/2" in lengths. To attach to the heddle bars you must unwind the twisted wire at the top. 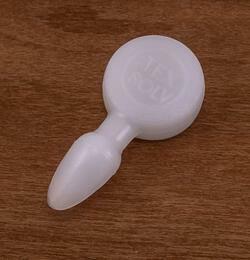 Though quite economical we prefer the flat fteel versions for their ease of use. It is possible to tie your own with lengths of carpet warp as well. Sold by the dozen. Texsolv polyester string heddles are gentle on your warp. They come in a continuous chain of 100 heddles. Do not cut them apart until you have them on the shafts and you&apos;re sure they fit. No returns on cut heddles. Measure from the top of the upper heddle bar to the bottom of the lower heddle bar to determine the correct length. 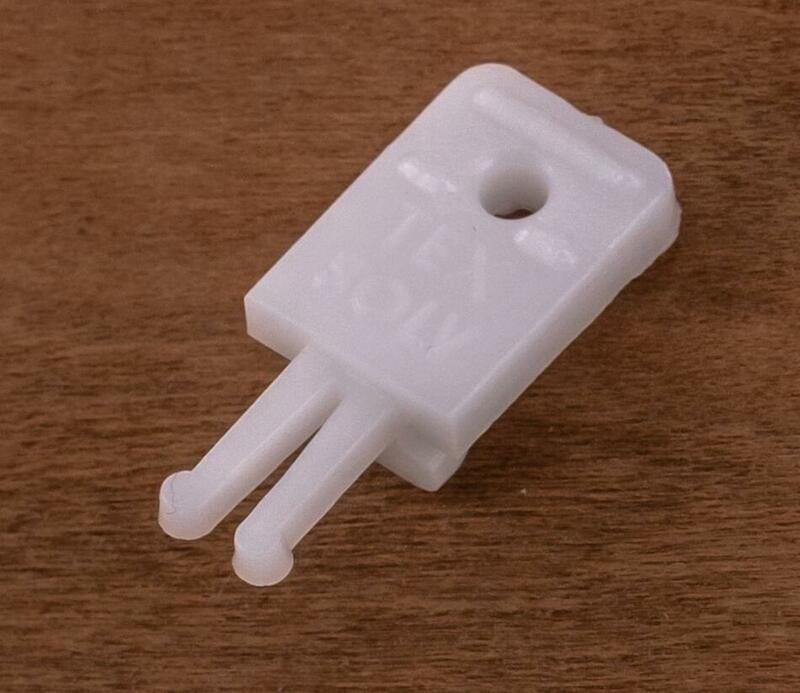 6 1/4" Texsolv Heddles white tie (160mm). Item Number: 6206000S. Price:$18.50/ea. 8" Texsolv Heddles black tie (205mm). Item Number: 6207000S. Price:$18.50/ea. 8 5/8" Texsolv Heddles green tie (220mm). Item Number: 6208000S. Price:$18.50/ea. 9 3/8" Texsolv Heddles brown tie (237 mm). Item Number: 6209000S. Price:$18.50/ea. 10 1/2" Texsolv Heddles pink tie (268mm). Item Number: 6210000S. Price:$18.50/ea. 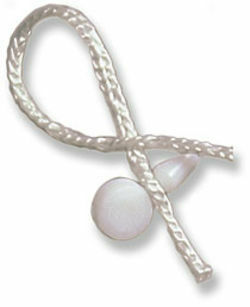 11" Texsolv Heddles white tie (280mm). Item Number: 6211000S. Price:$18.50/ea. 12 1/2" Texsolv Heddles blue tie (318mm). Item Number: 6212000S. Price:$23.00/ea. 13" Texsolv Heddles green tie (330mm). Item Number: 6213000S. Price:$23.00/ea. 15 1/4" Texsolv Heddles brown tie (390mm). Item Number: 6216000S. Price:$23.00/ea. 8 1/2" Insert Eye Heddles. Item Number: 6285000I. Price:$19.95/ea. Get everything you need to convert or tie up your loom. The Texsolv system of shaft and treadle tie-up is so versatile it has the answer for any tie-up problem. 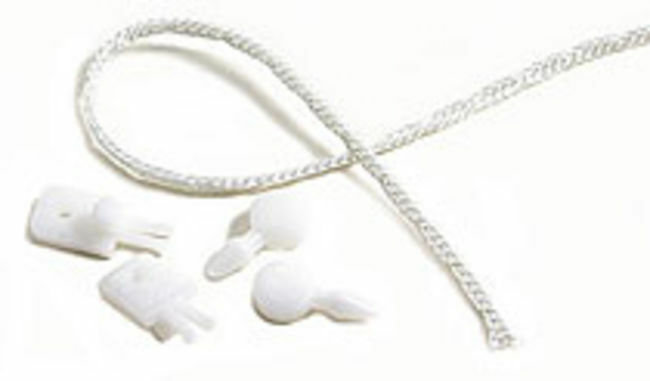 The polyester loop cord is a continuous string of " button holes" which can be threaded in and around various loom pieces and secured with either of the two styles of pegs: arrow or anchor. Most tie-ups require only the light loop cord as it has a breaking strength of 180 pounds! Only if you&apos;re working with a large rug loom is the heavy loop cord necessary. The Texsolv tie-up kit includes 54 yards light loop cord and 100 pegs, 50 of each style. The Texsolv system of harness and treadle tie-up is so versatile it has the answer for any tie-up problem. The polyester loop cord is a continuous string of " button holes" which can be threaded in and around various loom pieces and secured with either of the two styles of pegs: arrow or anchor. Most tie-ups require only the light loop cord as it has a breaking strength of 180 pounds! Only if you&apos;re working with a large rug loom is the heavy loop cord advisable. The Texsolv system of harness/shaft and treadle tie-up is so versatile it has the answer for any tie-up problem from shafts to treadles. The polyester loop cord is a continuous string of " button holes" which can be threaded in and around various loom pieces and secured with either of the two styles of pegs: arrow or anchor. Most tie-ups require only the light loop cord as it has a breaking strength of 180 pounds! Only if you&apos;re working with a large rug loom is the heavy loop cord advisable. Order by the yard. 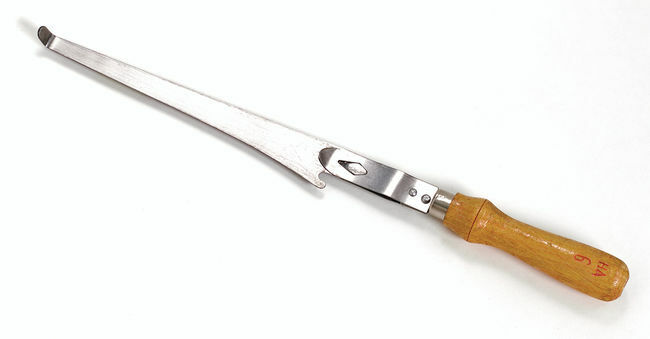 For sleying reeds, the shorter length and generous hook is favored by many weavers for the number of warps that can be pulled through the dent. Dimensions 4 1/16" x 1/2"
Halcyon’s brass hook does double duty as a heddle hook and as a reed hook. The hook is 6 1/2" long, well balanced and a joy to use. 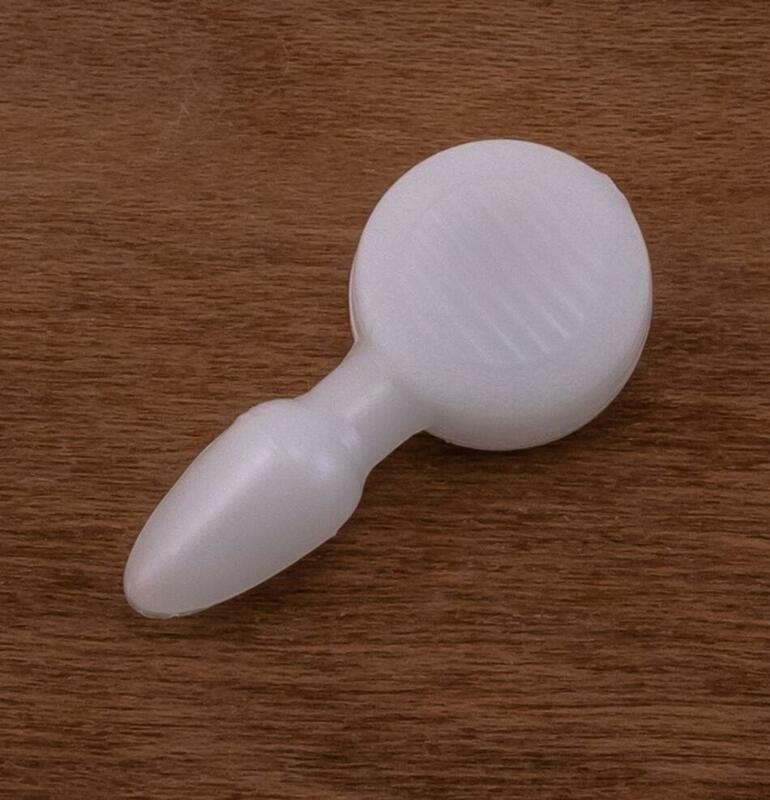 Best of all, our toll free number is engraved on the handle — we&apos;re here when you need us! Made in US. The long straight heddle hook shaft is 7 1/2" long with an easy-to-grip wooden handle and a small but well defined hook that fits easily through any heddle eye including most rigid heddles. 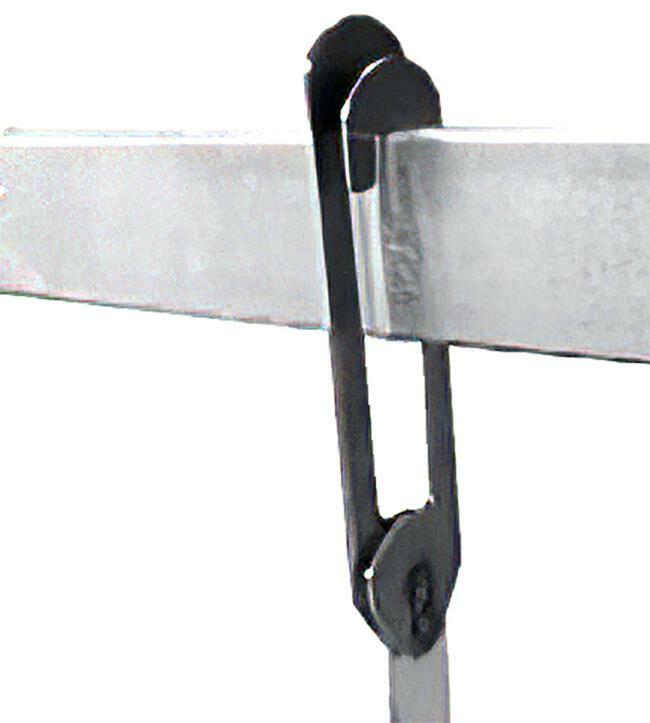 Leclerc&apos;s hook has a tilt down at the end which many weavers prefer. Shaft length is 8 5/8 in. Leclerc&apos;s hook has a tilt down at the end which many weavers prefer. Shaft length is 5 1/2" long. 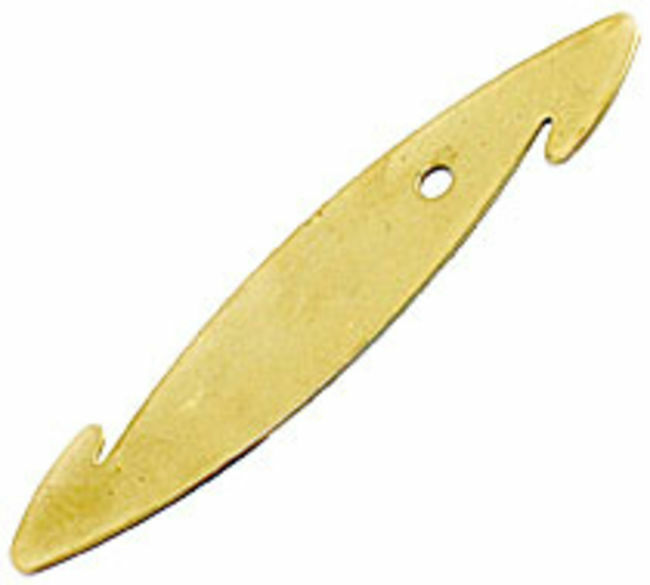 Leclerc&apos;s hook has a tilt down at the end which many weavers prefer. Shaft length is 10 5/8". Kromski&apos;s clear lacquer double ended rigid heddle hook. The new design modifies the original by thinning the width of the hook and adding a thin wire that can be used alternately making it easier to thread 10 or 12 dpi heddles.